Gloucester and twelve destination partners have bid successfully for a £500,000 grant from VisitEngland in a collaborative project to develop a range of experiences directed at the US tourism market. ‘Connections’ will produce a series of new, immersive, bookable English-themed visitor experiences specifically for the American market, encouraging visitors to explore England beyond London. The experiences will aim to tap in to the fascination of the many connections between England and America – a shared history, language, culture and ancestry. In an effort to inspire many visitors to discover their roots and the authenticity of local English culture. Connections is one of a number of successful projects to receive funding from the UK Government’s £40 million Discover England Fund. The Fund is administered by VisitEngland and involves a programme of activity to ensure that England stays competitive in the rapidly growing global tourism industry, by offering world-class English tourism products to the right customers at the right timeThe Fund is a central government funded programme of activity, supported by match funding by partners in the public and private sectors. “The calibre of submissions to the Discover England Fund reflects the innovation in product development thriving across the country’s tourism landscape. The successful projects will boost international and domestic visitor growth creating a step-change in the industry and spreading the economic benefits of tourism across England. Our research shows that many US visitors come to Britain due to historic family connections and these ancestry themed itineraries will inspire them to explore more of regional England. A large-scale collaboration between 13 destinations, Connections will develop tourism products in the lead up to 2020, the 400th anniversary of the Mayflower’s historic voyage from Plymouth to the New World. Gloucester along with Bristol, Cambridge, Cornwall, Essex, Hampshire, Hertfordshire, Kent, Lincolnshire, Nottinghamshire, Plymouth, Torbay and Worcestershire will look into themes with significant appeal to US visitors, such as Magna Carta and the rule of law, The writer of the American National Anthem, George Whitfield, The Mayflower, Virginia and early American colonisation, WW2, US military and the ‘special relationship’. The project also aims to showcase the best of England’s culture and heritage through the development of a broad range of specialist guided tours and behind the scenes experiences and will be sold in the US via tour operators and travel agents. There were 2.9 million overseas visits to the UK from January to July this year from North America alone, an increase of 21% on the same period last year. Born in Gloucester and educated at the King’s School. He became an American political leader, who as a representative of Georgia to Congress, was the second of the signatories (first signature on the left) on the United States Declaration of Independence. He was also the provisional president of Georgia in 1777, and Gwinnett County (now a major suburb of Atlanta) was named after him. Gwinnett was killed in a duel by Lachlan McIntosh following a dispute over a failed invasion of East Florida. His father’s tomb at Down Hatherley has been restored recently but there is probably some interpretation to do. I have asked Stephen if we can put a plaque on 10 College Green, where he would have lived as a child (as well as Down Hatherley) and we probably should do something at St Nicholas as his father was vicar there as well. Captain Blackburn arrived in Gloucester docks in August 1899 after sailing his 30ft cutter “Great Eastern” single handed across the Atlantic from Gloucester Massachusetts. He had spent 61 days at sea and had been affected by a badly swollen leg which prevented him from raising sail for 8 days. This journey was even more remarkable as he had lost all his fingers, both thumbs and a toe through frost bite during a severe winter storm on an earlier fishing voyage. Blackburn was welcomed at the quayside by a large crowd of sightseers. During his stay in the city he was entertained by a number of leading citizens. Several hundred people visited the docks to see his tiny craft and many were welcomed aboard and were offered bourbon whisky and ship’s biscuits. Whitefield was born in 1714 at the Bell Inn in Southgate Street. He was educated at King’s School, the Crypt Grammar School and later at Pembroke College, Oxford in1732. It was at Oxford that he met John and Charles Wesley and joined their Christian Society or “Holy Club” who were referred to as “Methodists”. Whitefield was ordained as deacon in 1736 and as a priest in1739 and preached his first sermon in St Mary de Crypt church. The pulpit he used, together with its sounding board can still be seen in the nave. He first sailed to America early in 1738, the first of 7 such trips, returning later the same year. Shortly afterwards he crossed the Atlantic again where he preached to large audiences from Pennsylvania in the north to Georgia in the south. The impact of Whitefield on both English and American society was immense and his greatest asset was his magnificent voice. Benjamin Franklin calculated that he could be heard by 30,000 people at any one time. The charity school he founded in Pennsylvania was the forerunner of the present University and he was also involved in the creation of the college at Princeton, New Jersey. No fewer than 51 American schools and colleges owe their inception to him. During his sixth visit to the colonies the Library at Harvard University was totally destroyed by fire and Whitefield secured a large gift of books from England to re-equip a new building. He died on Sunday 30 September 1777 at Newburyport, Massachusetts having preached no fewer than 18,000 sermons to an estimated 10 million people in his lifetime. John Stafford Smith was baptised in Gloucester Cathedral on 30th of March 1750. He was educated at the cathedral school where he became an accomplished boy-singer. By the 1770’s he had gained a reputation as an excellent composer and organist in London. This led to his election as a member of the very select Anachreontic Society that boasted amongst its membership Dr Johnson, James Boswell, Sir Joshua Reynolds, Henry Purcell and J.C. Bach. Smith composed the music for the society’s constitutional song entitled “To Anachreon in Heaven”. This song became popular in America following the establishment of several Anachreontic societies there. The poem was printed on handbills the next morning and distributed throughout Baltimore. The song became immediately popular and three months later it was played during the Battle of New Orleans. “The Star Spangled Banner” was officially adopted as the national anthem of the USA in March 1931. Born in 1897, he came from Chicago and trained as a pilot at Camp Benbrook, Fort Worth, Texas. He was commissioned as a 2nd Lieutenant in the Royal Flying Corps in January 1918 and joined the largely American 90 Squadron in June and was promoted to full Lieutenant in the newly formed RAF. The squadron was transferred to Brockworth on the 15th of July to await delivery of their Sopwith Dolphin single seat fighters. A week later only one aircraft arrived and the pilots drew lots to see who would be the first to fly it. Brown held the winning ticket and immediately took off to put the plane through its paces. He put the aircraft into a series of screaming dives pulling out at about 100 feet above the ground. Halfway through a dive the port wing folded up and the plane went into a corkscrew spiral into the ground. Malcolm Cotton Brown was killed instantly. A tree was planted in his memory at Brockworth and there is a large memorial plaque to him in St Mary de Lode church containing the words “A son of America fallen for England”. An American Puritan who graduated from Harvard in 1656 and was later described as the “most distinguished American of his generation”. He became an assistant to James Forbes the Presbyterian minister in Gloucester. Mather preached at St Mary de Lode church in the morning and at the cathedral in the afternoon. 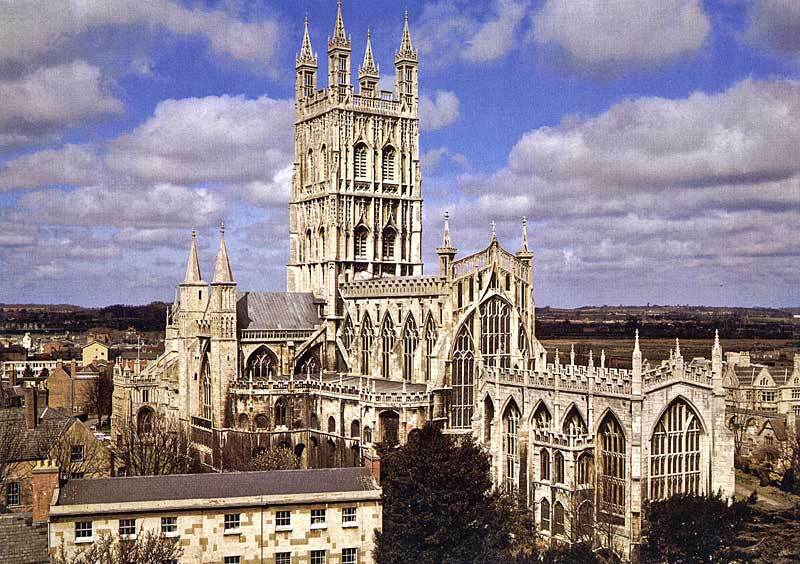 Although he was delighted with Gloucester and resolved to devote his life to its spiritual needs, he left the city in 1660. Mather refused to conform to the reformed Church of England and returned to America in June 1661. He travelled to England again in 1688 in an attempt to restore the Charter for Massachusetts which had been lost in 1684. Mather became the sixth president of Harvard College from 1692 till 1701. Mather was involved in denouncing the tests for witchcraft used during the famous Salem Witchcraft Trials. The oldest peal of bells in the USA are in Old North Church, Boston. They were made in 1744 by the famous Rudhall foundry in Gloucester and installed in 1745. One of the first bell ringers at the church was Paul Revere who with William Dawes made the historic ride to warn the rebel militia that “The British are coming”. This was a prelude to the first battles of the American Revolution. The church tower was used to warn of the approach of the British forces. One light for an advance by land, two lights for one by sea. The Rudhall foundry was on the site of the present Post Office in King’s Square. There is a plaque to the right of the entrance. The following anecdote was related by an American visitor during a guided tour of Gloucester. His father had been a Provost Marshall with the North American forces on their arrival in England. “Two Provost Marshalls visited Gloucester prison to assess the suitability of the accommodation for the detention for any law breaking military personnel. They requested to be locked up in one of the cells that evening and not to be released until 7.00am the following morning. The prison staff duly obliged, but were shocked to find that the two marshalls had escaped sometime during the night”. Press enquiries: For more information, please contact Ben Hau on 01452 207020 or email ben@marketinggloucester.co.uk. English Riviera BID Company Ltd. In November 2015, the Government announced a £40 million Discover England Fund; an unprecedented opportunity for English tourism. The Fund aims to deliver world-class bookable tourism products joined up across geographies and/or themes; including integrated transport solutions to provide an end-to-end customer experience. The Fund supports the growth of one of England’s most successful export industries, inbound tourism. Tourism is an industry that delivers jobs and economic growth across the English regions – contributing some £106bn each year to the economy and supporting 2.6 million jobs. Continuation funding for existing year one projects that demonstrated early learnings (in year two). Working with a wide range of partners in both the UK and overseas, our mission is to grow the volume and value of inbound tourism across the nations and regions of Britain and to develop world-class English tourism product to support our growth aspirations. For further information and to access the latest in-depth market intelligence and statistics visit visitbritain.org or www.visitbritain.com and www.visitengland.com for consumer information. Promotes the City as a great place to live, work, study, visit and invest; locally, nationally and internationally. Organises award-winning events and festivals, delivering to the city and region hundreds of thousands of visitors and millions of pounds of GVA*. Engages with businesses and investors. Implements programmes to develop pride of place amongst residents. Partners with Gloucester City Council, gFirst LEP, Cotswolds Tourism and Gloucestershire County Council. Marketing Gloucester is a public private partnership. Meet the Government’s Tourism Policy criteria on Governance (or working towards it). They must be partnerships between the public and private sector, including newly-formed Local Enterprise Partnerships (LEP) whereManagement Forum brings together senior executives from England‟s Destination Management Organisations in order to enable productive, collective engagement with each other and with the lead tourism body, VisitEngland, around a joint agenda of national and local tourism growth and management issues affecting their organisations. destination, identifying clear actions and the roles & responsibilities of stakeholders. strategy, e.g. be working to develop and promote attract and disperse brands. Selflessness – Holders of public office should act solely in terms of the public interest. They should not do so in order to gain financial or other benefits for themselves, their family or their friends. Integrity – Holders of public office should not place themselves under any financial or other obligation to outside individuals or organisations that might seek to influence them in the performance of their official duties. Openness – Holders of public office should be as open as possible about all the decisions and actions they take. They should give reasons for their decisions and restrict information only when the wider public interest clearly demands. UK economy was £161bn or 11.4 per cent of UK GDP. *GVA is the value of the sector’s output minus inputs bought from other sectors and taxes and subsidies. particularly important part of the UK economy.